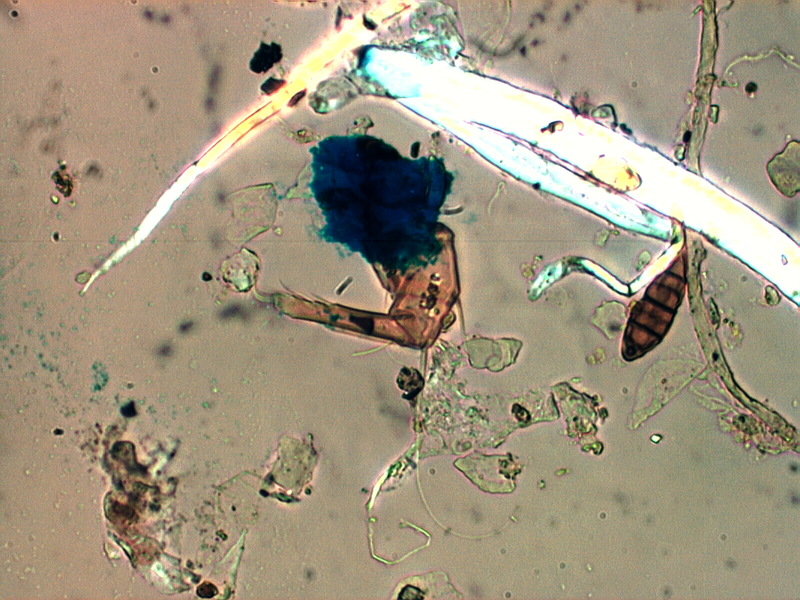 This is a tapelift sample from a school showing a mite leg, Alternaria fungal spore, paper fiber, skin flakes, clothing fiber, natural minerals, blue dry erase ink, and humus. The mite leg appears to be from a Tyrophagus mite, a potent allergen but not one detected by the common mite allergen tests. The blue spots and stain in this image are all from the pigment in the blue dry-erase dust present. Some of the skin flakes have picked up a bit of the blue stain. From a health complaint standpoint the mite fragment and the dry-erase debris are the most concerning. The mite fragment indicates the presence of a potent allergen in the environment. The dry-erase debris indicates an exposure to solvents primarily by the teacher in this environment. The dry-erase pigments have not been around long enough to know if they might generate health complaints.